Historia luget, Eloquentia niuta est. 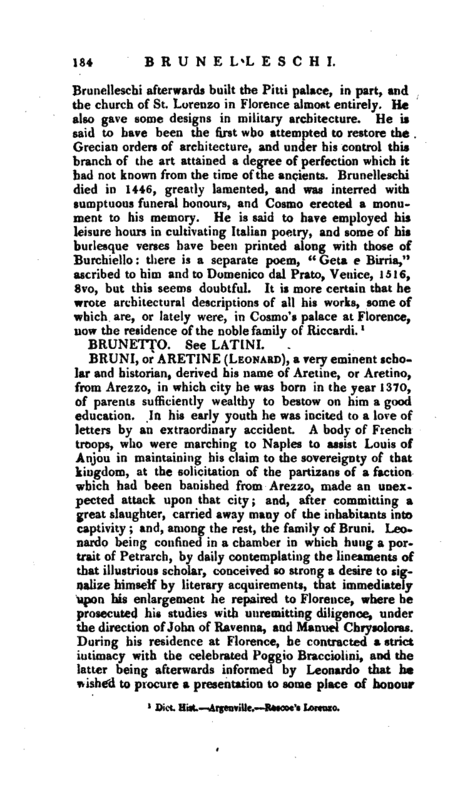 Leonardo Bruni was not only one of the most learned men of his age, but one of the most amiable in character and manners, nor was his fame confined to Italy. The learned of France and Spain travelled to Florence to have the honour of seeing him, and it is said that a Spaniard who was ordered by the king to pay him a visit, knelt down in his presence, and could with difficulty be | persuaded to quit that humble and admiring posture. 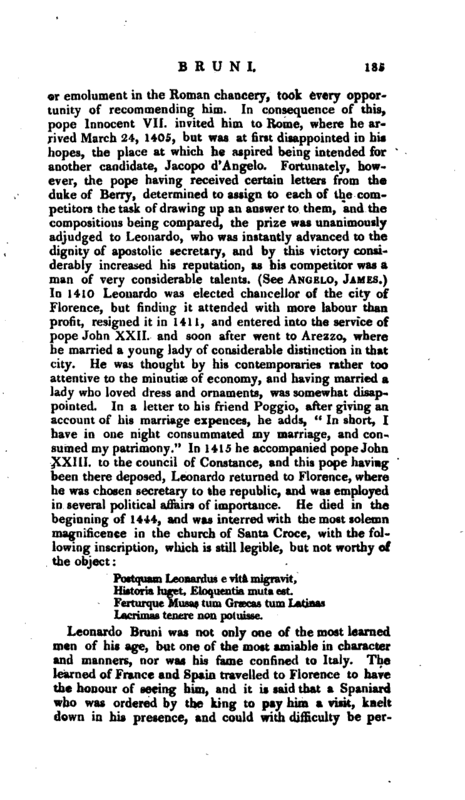 These honours, however, excited no pride in Leonardo, The only failing of which he has been accused is that of avarice; but, as one of his biographers remarks, that name is sometimes given to prudence and economy. His friendships were lasting and sincere, and he was never known to resent ill-usage with much asperity, unless in the case of Niccolo Niccoli, who appears to have given him sufficient provocation. The case, indeed, on the part of Niccoli appears abundantly ridiculous; a termagant mistress whom he kept had been publicly disgraced; and Niccoli expected that his friends should condole with him on the occasion. Leonardo staid away, for which Niccoli reproached him, and when Leonardo offered him such advice as morality as well as friendship dictated, irritated Leonardo by his reiterated reproaches and insultinrg language. 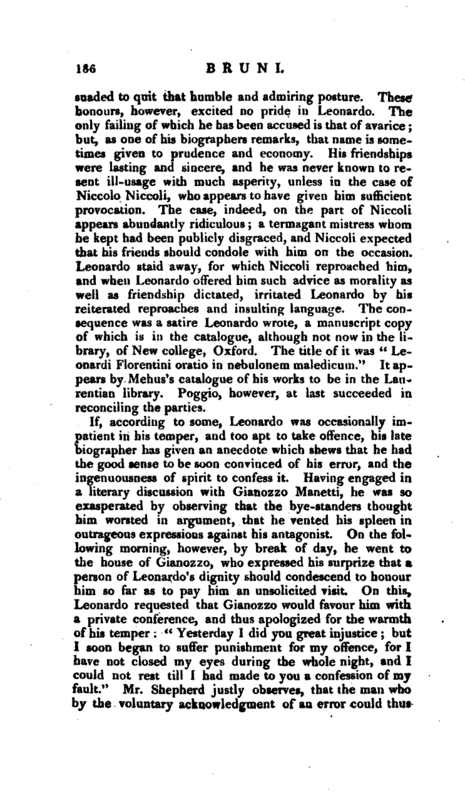 The consequence was a satire Leonardo wrote, a manuscript copy of which is in the catalogue, although not now in the library, of New college, Oxford. 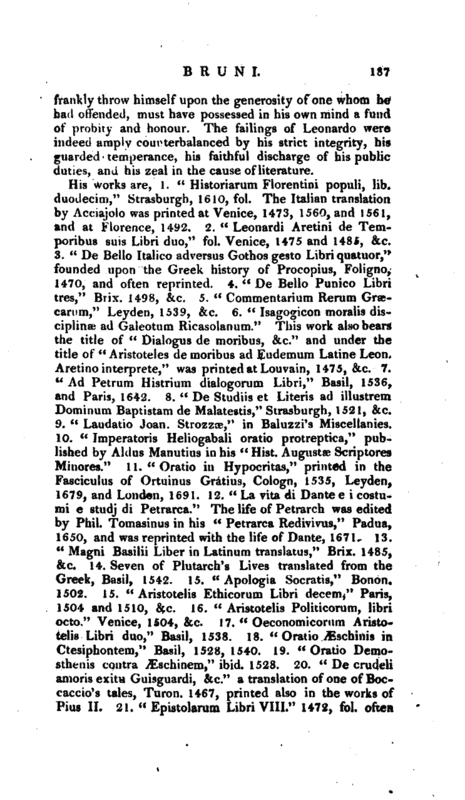 The title of it was “Leonardi Florentini oratio in nebulonem maledicum.” It appears by Menus’ s catalogue of his works to be in the Laurentian library. Poggio, however, at last succeeded in reconciling the parties. If, according to some, Leonardo was occasionally impatient in his temper, and too apt to take offence, his late biographer has given an anecdote which shews that he had the good sense to be soon convinced of his error, and the ingenuousness of spirit to confess it. Having engaged in a literary discussion with Gianozzo Manetti, he was so exasperated by observing that the bye-standers thought him worsted in argument, that he vented his spleen in outrageous expressions against Jiis antagonist. On the x following morning, however, by break of day, he went to the house of Gianozzo, who expressed his surprize that a person of Leonardo’s dignity should condescend to honour him so far as to pay him an unsolicited visit. On this, Leonardo requested that Gianozzo would favour him with a private conference, and thus apologized for the wajrmth of his temper: “Yesterday I did you great injustice ~; but I soon began to suffer punishment for my offence, for I have not closed my eyes during the whole night, and I could not rest till I had made to you a confession of my fault.” Mr. Shepherd justly observes, that the man who by the voluntary acknowledgment of an error could thus | frankly throw himself upon the generosity of one whom he had offended, must have possessed in his own mind a fund of probity and honour. The failings of Leonardo were indeed amply counterbalanced by his strict integrity, his guarded temperance, his faithful discharge of his public duties, and his zeal in the cause of literature. Shepherd’s Life of Poggio Bracciolini, p. 29, 45, 132, 388. Ginguene Hi*t. Lit. d’ltalie, vol. III. 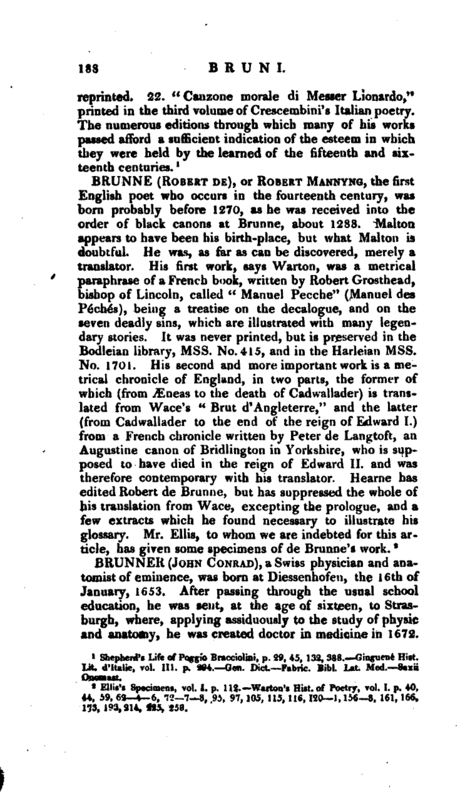 p. 294. Gen. DietFabric. Bibt. Lat. Med. —Saxii Onomast.